CFO Thomas Hollister and Executive Vice President Katie Lapp discuss the University's financial performance for fiscal year 2017 coinciding with the release of the annual financial report. Harvard closed the 2017 fiscal year with a $114 million surplus on its $4.9 billion budget, a result that University budget officials credited to wise management of resources across the University and lower interest costs due to major debt refinancing a year ago. 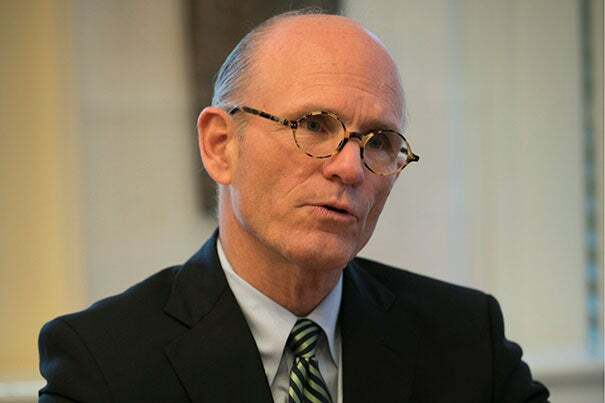 Harvard Executive Vice President Katie Lapp and Chief Financial Officer and Vice President for Finance Thomas Hollister sat down with the Gazette to talk about the fiscal year, which ended June 30. Though they said the surplus is encouraging, they expressed continued caution about financial pressures faced by higher education, even as they applauded faculty members for bringing in more federal and private research dollars. Lapp and Hollister also spoke about Harvard’s endowment and the importance of the $1.8 billion it provided to the University’s budget last year. They discussed the capital campaign, the importance of financial aid in supporting Harvard’s need-blind admissions policy, and the status of campus construction projects, among other topics. GAZETTE: Harvard’s annual financial report, which looks back at the year recently concluded, has been released. How would you describe last year’s results? What were the bright spots and causes for concern? LAPP: The report shows great momentum for the University. It reflects a process by which we are targeting investments in the academic mission of the University, coupled with good financial stewardship. That has been buoyed by the capital campaign, which has allowed us to make the types of investments that are going to continue to make this University a stellar one. GAZETTE: How important is the $114 million surplus? What does that tell you about the University’s financial operations? HOLLISTER: We would rather have a surplus than a loss, I should start with that. Last year’s surplus was up $37 million from the previous year, but we need to put that in context because $33 million of the increase can be ascribed to a reduction in interest costs due to the refinancing of Harvard’s debt during the year. Results also benefitted from the timing of some current-use gifts that came in right at the end of the year. So that was also a one-time boost. I think that we need to be cautious because last year’s surplus could be a high-water mark for a while because of the pressures on revenues in higher education. GAZETTE: What can you tell us about the refinancing, since that seems to have been a significant part of the surplus? HOLLISTER: It’s a nice story and a great testimony to Harvard’s standing in the investment community. The refinancing of $2.5 billion was done last October, and two $500 million tranches of taxable new debt were the lowest-recorded interest rates in the history of the taxable bond market for debt with similar maturities. GAZETTE: How would you summarize the University’s financial performance on the spending side? What were the key drivers of expenditures? LAPP: There isn’t any particular thing that stands out. What the report reflects is our continued commitment to financial aid, to our teaching and research mission, and investments in our facilities. HOLLISTER: I would also add that the Schools and every organizational unit have very carefully managed their resources to be within the limits of their revenues and focused on their mission. GAZETTE: What were the major developments on the revenue side? What were some key areas of growth? HOLLISTER: It was a good year. Revenue was up 5 percent, which is a healthy number for higher education. And, happily, this year the traditional sources of revenue kept pace: net tuition, federal funding, and the endowment payout. The two bright spots in particular — which are important for the future — were continuing and executive education and nonfederal funding, which were both up 8 percent. LAPP: Executive education and continuing education reflect a commitment by our various Schools to this concept of lifelong learning, and to their ability to reach out not only to alumni but also to members of the community who might be interested in continuing their quest for learning. GAZETTE: Is that a sign that the University is responding to the changing educational landscape, to changes in how people learn today? HOLLISTER: I would say Harvard is at the forefront of these exciting new pedagogical means and methods of teaching, through online as well as blended learning. There’s also a commitment to reach people of different ages in different places around the world with Harvard’s extraordinary faculty. Every School is active in this area. LAPP: It’s also reflective of our investment in new platforms that enable this style of teaching — EdX, HarvardX — and a variety of blended learning initiatives, whether at the [Harvard T.H. Chan] School of Public Health or the Division of Continuing Education, or other places in the University. GAZETTE: You also mentioned an increase in nonfederal research funding, and as I recall that was a growth area last year as well. The total may be dwarfed by federal research funding, but how encouraging is it that faculty members are able to find new sources of support? HOLLISTER: It is a credit to the standing of Harvard’s faculty and the excellence of their work that they continue to attract important federal funding. But as that funding source shows signs of potential decline, our faculty are attracting dollars from other sources — foundations, primarily, but corporations and individuals as well. GAZETTE: The endowment’s 8.1 percent growth was announced in September. What can you say about the importance of the endowment to the University budget and how its results affect financial flexibility? HOLLISTER: Endowments are often misunderstood and mischaracterized as stashes of unused and hoarded money. They’re actually quite the opposite. The endowment is very active, and it’s our leading source of revenue. Last year, 5.4 percent of Harvard’s endowment was distributed to support the University’s budget and helped make possible our world-class teaching and research, as well as our generous financial aid. The importance of philanthropy at Harvard can’t be overstated. The endowment distribution provides 36 percent of revenue, and current gifts — given by donors for current use — is another 9 percent. So fully 45 percent of our revenue is thanks to current and past donors. It is certainly a great blessing for the University. GAZETTE: How is the endowment payout rate determined? HOLLISTER: The annual payout is governed by the Corporation, and last year’s payout amount was a careful balance between making available as much money as possible for last year’s use while safeguarding the endowment’s buying power for future generations. GAZETTE: Recently, the Harvard Corporation set a “collar” to determine endowment distributions in fiscal years 2019-2021. What is a collar, and how will it affect University budgets? HOLLISTER: A collar is a financial term for having a floor and a ceiling on the increase in the distribution for coming years. The Corporation has determined that, for three years, the increase in the distribution will have a floor of 2.5 percent and a ceiling of 4.5 percent. There is a caveat that if the markets go haywire, the collar may not be followed. Hopefully, if the markets go haywire, they’ll go haywire up. This three-year period begins in 2019, so the distribution to the budget in 2019 will be 2.5 percent higher, and the distribution is likely to be within the collar for the following two years as well. The purpose is to give the University and the Schools some certainty around financial planning for the next several years. GAZETTE: How has the campaign affected the budget? Has it mainly been through contributions to the endowment, or have current-use contributions helped as well? HOLLISTER: Happily, it’s both of those, as well as gifts for new buildings. Current giving is at much higher levels than it was prior to the campaign, so that’s a boost right into current operations. A big portion of gifts and pledges has been focused on the endowment, which provides sustained support. GAZETTE: We’ve been operating in a period of constrained federal resources for some years. How was federal funding of Harvard research last year? HOLLISTER: Federal funding was up 3.5 percent, which was very good and a testimony to the faculty. With spending falling from the American Recovery and Reinvestment Act, most institutions of higher education were seeing declining federal funding, including Harvard. It did, fortunately, bounce back last year. We’re not sure that’s a signal for the future because of funding uncertainty, but it’s important to know that Harvard’s faculty, in testimony to the excellence of their work, consistently garner grants in support of their critical research. GAZETTE: Significant attention at Harvard is given to student affordability, particularly at the College. What does the report tell us about Harvard’s efforts over the past year? HOLLISTER: Harvard’s undergraduate financial aid program is designed so that any promising admitted student in the world can come here on a need-blind basis. Of the more than half of undergraduates receiving financial aid, the average cost to families is about $12,900, and their student can walk away without debt. It’s made possible thanks to the generosity of our donors. GAZETTE: The University has several important construction projects underway. How has progress been on capital improvements? LAPP: As I reflect on the investments thus far, I put them into several buckets. One is research and teaching. One of the most prominent projects is the Harvard Kennedy School expansion, which is opening in January. The Science and Engineering Complex is underway in Allston. They’ll be topping off the steel on that project next month, and it is on schedule to open in the fall of 2020. That will be largely for our Paulson School of Engineering and Applied Sciences, but many Schools will use the facility. In areas of community, House renewal has been perhaps the No. 1 project, and Winthrop is the most recently renovated House that has come online. We have two other examples: the Cabot Library in the Science Center and the Pritzker Commons area, which continue to add vitality to undergraduate life as well as that of faculty and graduate students. Also on line for the next academic year will be the Smith Campus Center, which is under renovation. We’re on schedule to reopen that in 2018. The third category is innovation, so adding to the i-lab — which has been a huge success — is the Pagliuca Life Lab, which opened last November. And soon we’ll be adding the ArtLab project, which will open in January 2019. GAZETTE: Looking ahead at the coming year, what pressures or opportunities do you see? HOLLISTER: The Schools are very aware of their operating environments and trying to be careful stewards of their resources, to focus on research and teaching while being cognizant of the overall revenue picture. Harvard is well positioned to continue to succeed. LAPP: As we transition to a new leader, we’ll have a great foundation upon which to continue the progress that Drew Faust has made over the last nearly 11 years of her tenure.